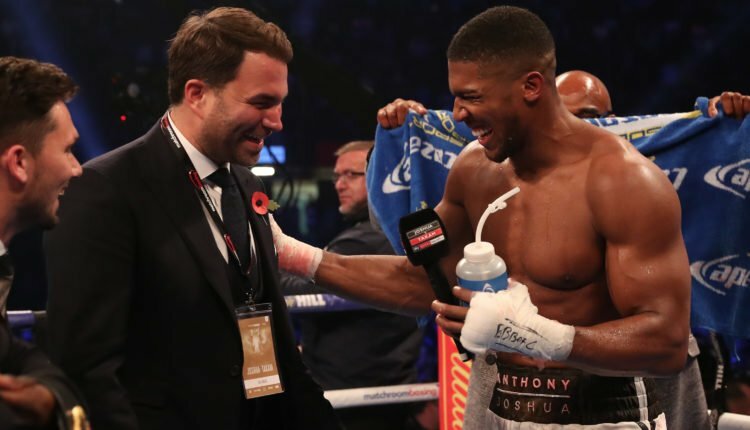 While Deontay Wilder prepares for his return to the ring, he and his team don’t want to head into negotiations with Anthony Joshua, Eddie Hearn isn’t looking to wait around. Hearn, who acts as the promoter for IBF, IBO, WBA, WBO heavyweight champion Anthony Joshua, wants to establish a set of terms with Wilder’s team prior to his December 1st fight against Tyson Fury. “What I want his legacy to be, which is something he shares, is to be one of the greatest heavyweights of all time, to be the undisputed champion is the ultimate goal, it might happen as soon as April 13,” Hearn told Sky Sports on a potential Wilder-Fury showdown at Wembley Stadium. If Wilder’s name is not on the bottom line, Dillian Whyte is next in line for a rematch of his 2015 knockout loss to Joshua.